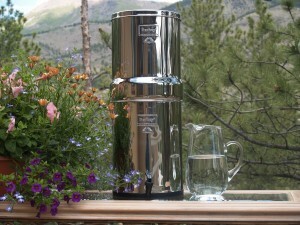 The Imperial Berkey water purifier is the second largest system available. Like the Crown, It’s great for large families and groups. The Imperial Berkey is second only to the Crown in home and emergency use water purification systems. It comes supplied with (2) Purification Elements but can accommodate up to (6) Purification Elements at a time. You may add additional Purification Elements in the drop-down box below. The Imperial Berkey is the second largest system available in our entire line of water purifiers. 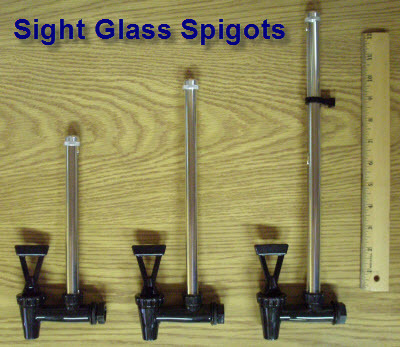 It is ideal for use on your countertop, or in any emergency situation. The Imperial water purifier will provide you with immediate purified water in the event of an emergency, or if you just want to filter your well, or municipal water source like so many people do. This water purifier is made of 304 Stainless Steel (the same material used in professional kitchens and food service,) so you can expect it to give you many years of great service as well as being an attractive appliance in your home. 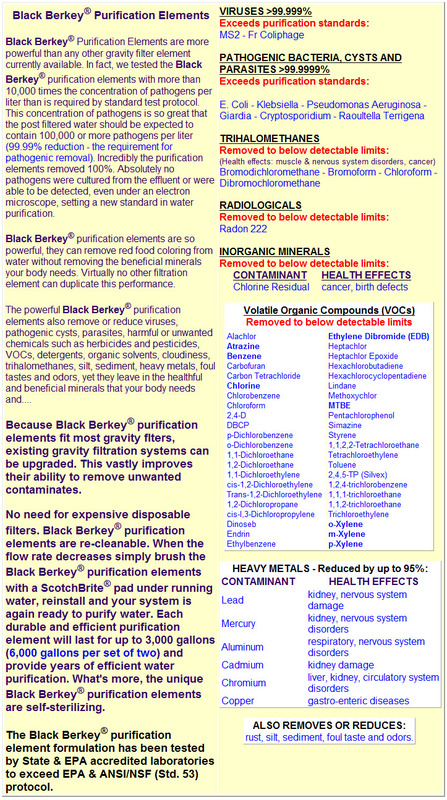 The “Black Berkey Purification Elements” used to purify water very quickly, are what makes our purifiers so great at ensuring clean and pure water is available even during the worst disasters. The stats below have some great information…but fully loaded with 6 purification elements, the Imperial Berkey water purifier is capable of producing at least 18,000 gallons of pure drinking water from nearly any “raw water” source like lakes, stagnant ponds, streams, rain, or even a mud puddle. That totally rocks! The Imperial Water Purifier is a filter and more importantly a water purifier. It won’t let the nasties (pathogens) like giardia, cryptosporidium, heavy metals, get into your glass, and even gets rid of bad tastes and odors…(See the Technical Specs Below.) Pressurized water isn’t needed, so no matter what’s happening, if you have access to water, you have access to clean water with your Imperial water purifier. The design is very ingenious…it uses gravity and the natural pressure of the water in the system to allow the water to pass through the micro-pores of the purification elements. Those “micro-pores and a lining of pure silver keep even the smallest pathogens from getting into your drinking water. The silver lining also prevents reproduction of bacteria inside the water purification elements. Nasties really don’t want to be anywhere near these purification elements! Purify Water and Help Your Neighbors! We recommend any of the larger water purifier systems as they are very similar and because you may not be the only person who needs water during an emergency. The larger water purifiers allow you to help your family, extended family, friends, and neighbors with life saving water. You’ll actually have enough water purification power to help a good portion of your neighborhood or even your town! To purchase the Imperial Berkey Water Purification System just click on the “Add to Shopping Cart” button and choose your method of payment. It comes with 2 Black Berkey Purification Elements, but you’ll really want to add up to 8 more purification elements for improved water flow, increased capacity, and have a couple of back-ups. This water purifier will allow you to help others who also need water during an emergency, or just enjoy great tasting water all the time at home. Your advanced preparation can literally save lives and bring you real peace of mind!